JENN: Okay, so today's topic is one that is near and dear to my heart: The Jenn Method for Haranguing Moon Into Riding Roller Coasters. JENN: Annnd that's it! Thanks everybody for your time. Nothing a good punch in the face can't cure. No, but seriously: First I would like us all to cast our minds back, back, back to 2008, and our very first WDW trip of the modern era. 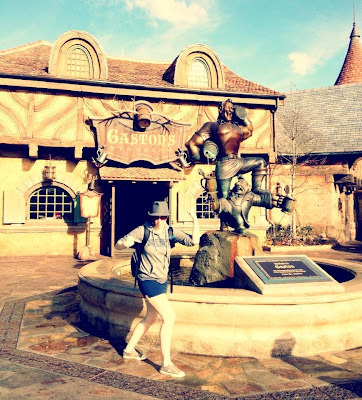 Moon has never been a roller coaster sort of person, but because WDW coasters tend to (mostly) be on the milder side, we (Liz and Megan were with us too) collectively and I promise you GENTLY pressured her into trying things. Because you may as well try things, right? Well, let's try a little free association. I'm going to say a phrase, and Moon is going to react to it. Ready? Big Thunder Mountain Railroad. MOON: Haaaaaaate. This ride is dangerous. Stay back. JENN: Yeah. She had a tremendously violent reaction to that one... which none of us understood because it's Big Thunder and... I mean, it's Big Thunder. It's barely a step above the Barnstormer. ] Nevertheless, that was a bust. Space Mountain made you cry but then you said you thought you liked it? JENN: And you went on Everest but missed the yeti because you refused to look up. So really I don't know how well our campaign went, in summer of 2008. We hadn't even begun our ascent through the first temple yet. MOON: Hey, at least I got on it! Now flash forward just a bit, about six months later, to December of 2008. Moon and I had gone on a last minute trip, and because it was just the two of us (and/or because I'm a terrible person?) 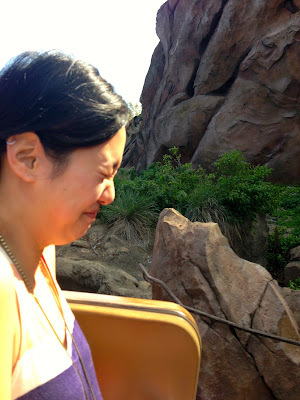 I dragged her back onto Expedition Everest. And so occurred one of my absolute favorite exchanges of all my WDW memories. We had just completed the last pass through the mountain, escaped the yeti, and were pulling slowly around the corner toward the station. Moon turned to me and said, in absolute seriousness, "Is the big drop coming?" To which I replied: "... The ride's over." I don't know. A flip switched or something. I got her onto Everest again. Then we went on Space Mountain three times. 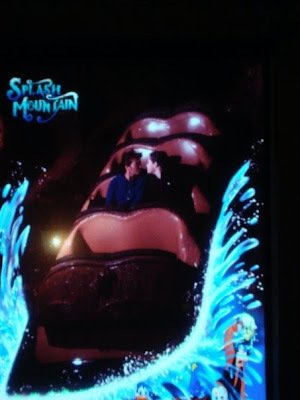 Then we went on Splash Mountain I don't know how many times because she decided she loved it. It was pretty awesome. we're doing and gaze lovingly into each others' eyes. MOON: I blame it on the cool winter (Floridian) air. JENN: And not the awakening of the lion that is the core of your soul? MOON: Um... I think at the core of my soul is something more akin to a turtle. JENN: Now, all of this is very impressive - a non-coaster person developing a fondness for Disney coasters. However, as I mentioned, WDW coasters tend to be on the tamer side. The exception? The Aerosmith Rock 'n Roller Coaster. Moon, would you like to tell the nice people what you rode last trip? JENN: That must've been awkward. MOON: I feel like an Aerosmith pun would be appropriate here, but Jenn can tell you what I think of Aerosmith. JENN: But you did it! You rode the beast! MOON: I did! But, I think I made the ride a little unbearable for the people in front of us, with the screaming. >_> And I can't tell you how many times I've waited through that line with every intention of getting on and then at the last moment, I leave. It's watching the cars take off into darkness. In my mind it is a car taking off into death. JENN: My favorite part is about how you thought I was lying to you. MOON: I cannot be held responsible for anything I said under duress. JENN: I TOLD you there weren't any drops. It's gentle and honest coercion I dole out, I swear! Moon has now been on almost everything, enjoys most things, and claims she will ride RnR again. But she still puts the kibosh on Big Thunder. JENN: Haha, that's what counts! So, when the new Seven Dwarfs Mine Train opens up, will you ride it with me? MOON: Sure. At least twice. Then I'm OUT.